San Francisco: It抯 been a long time since I have driven a Corvette so seeing the � version in the flesh, colloquially know as the C6 because it is the sixth generation Corvette, was a shock. Not that there were not familiar touches, I mean I knew it was a Corvette from the moment I laid eyes on it, but it was so different, so small. Although the wheelbase has gone up 1.2 inches to 105.7 inches, the overall length has come down 5.1 inches. Do the math; the wheels have been pushed farther out towards either end. The width is down one inch. The weight is virtually the same at 3245 pounds for the base model, and the weight distribution is unchanged at 51% front and 49% rear. The biggest change, the one thing you will notice right away are the headlights. They are right there, out in the open. Every Corvette made since 1963 has had hide-away headlights but for � Corvette returns to always-exposed lights. Why? For the same reason they were hidden before, aerodynamics. Up until the late �s the government mandated that headlamps had to be a specific size and shape. In order to obtain smoother airflow, at least during daylight hours, Corvette had hide-away or pop-up headlights. With the loosening of government regulations and new technology it is now possible to build headlamps that are a continuation of a vehicle抯 shape. No more beautiful by day, frog-like by night. The biggest change though is unseen, under the hood. New for � is a 6.0-liter, all aluminum, OHV V8 that produces an incredible 400 horsepower at 6,000 rpm and 400 pound-feet of torque at 4,400 rpm. Compare that with last year抯 Z06, the performance Corvette with 405 hp and the same torque. 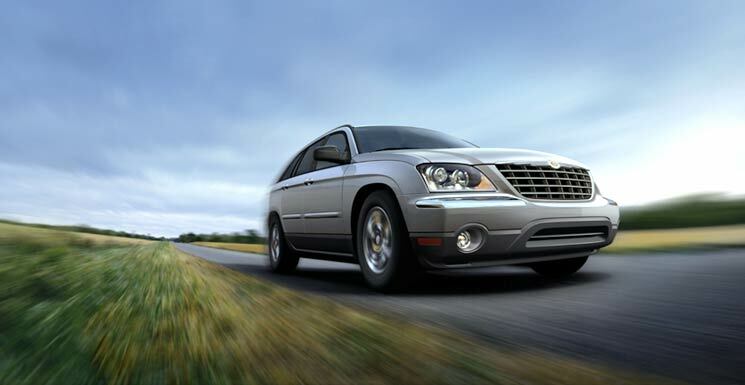 The � base engine is the virtual equal to the � performance version even down to the fuel economy figures! With a manual transmission, the � Vette is rated at 19-mpg city and 28-mpg highway. I do have one concern about the engine though; I wonder how many Corvette buyers need or will use all that power. Look back forty years to the 1965 Corvette. There were six different engines available from the base 250 hp 327 V8, all the way up to the 425 hp 396 V8; an engine for everyone. I抦 not suggesting that Chevrolet go back to so many engine combos but for the majority of the folks who buy a Corvette, 400 hp is overkill. Having said that I still cannot wait for the next Z06 rumored to have 500 hp! Driving the � Vette is about more than just power though, this is a thoroughly modern GT. It is comfortable and relatively easy to get in or out of. Chevrolet says they paid a lot of attention to the interior and it shows. Just about everything was located where intuitively it should be, right where you hand lands. The soft material used on the door panels and dash is something GM calls 揷ast skin.� According to GM it 搑etains the look and feel of genuine leather with excellent softness, low gloss and low glare that conveys an overall premium appearance and quality.� Sometimes marketing hype goes too far doesn抰 it? It is vinyl, darn good vinyl, but vinyl none the less. Regardless of how the marketing guys describe the interior, it works. The � goes so far beyond the previous Corvette in performance, ride and handling, and braking that it made me wonder if GM had hired new engineers or just loosened the reins on the ones they have. The � Corvette was no slouch but the � is miles ahead, on par with the best of the best. The � Corvette is equipped with substantial rubber; there is probably enough rubber here to outfit at least two family sedans. The front tires are P245/40ZR-18 and the rears are P285/35ZR-19. The base � has Goodyear Goodyear Eagle F1 GS Extended Mobility tires, while the Z51 Sport Package uses Goodyear Eagle F1 SC Extended Mobility with Asymmetric Tread. There are three different suspension systems available; the base, which is set up for a more comfortable ride; the Magnetic Selective Ride Control (adaptive suspension), and the sport oriented Z51 package. This Corvette sticks, folks. 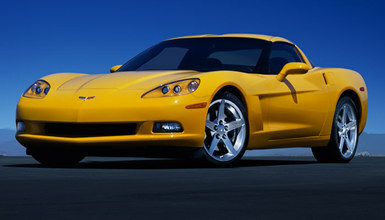 Between the tires and suspension, the � Corvette is capable of handling limits that will far exceed those of most owners. My advice is to leave the Traction and Active Handling controls on. There are three settings � full on, 搑ace track� (it allows some wheelspin), and off. Turn it off only at your own risk. There is so much torque available under your right foot that on dry pavement it is easy to get the back end to slide out under acceleration. From a stop with it turned off, the rear tires keep spinning well into third gear with the four-speed automatic. Chevrolet gives some astounding performance figures for the � - it is capable of 186 mph (300 km/h), faster than any production Corvette in history. It can reach 100 km/h (62 mph) from a dead stop in 4.2 seconds and in 4.1 seconds with the optional Z51 Performance Package (different gearing), and covers the quarter-mile in 12.6 seconds at 114 mph (183 km/h). If there is a problem with the Corvette, any Corvette, it is that the majority of people who buy it will be old farts my age. I see them driving in the slow lane. Sacrilegious! Corvettes were not built for the slow lane of life folks. We work and slave our whole life just to buy a Corvette and drive like an old man? Column Name: An American Revolution?